If you’re considering a dual fuel (hybrid) generator with a peak load of 1000W (surge watts), the Ford FG11050PBE is one machine that you have to take a look at. The mighty Ford actually gives you quite a bit more power than this. We’re going to be providing a comprehensive review of this 9000W/11050W dual fuel generator. As a comparison, we’re also going to review the Westinghouse WGen7500DF. The demand for gas generators with a peak output of around 10000W is huge. There’s a good reason for this. When you have a constant rated load of 7000-8000W (or more in the case of the Ford FG11050PBE), you’re able to run most of your household power needs as well as meeting most construction site or farming generator requirements. This means that there are countless options available for this class of generator. There’s a plus side to this in that having a big variety of options to choose from, gives you the opportunity to find the perfect generator for your needs and your budget. The downside is that too many options can make your decision a tough one. Which is really the best 10KW generator? There’s no clear-cut answer to this question and it will always come down to personal preference. One has to start somewhere and our aim is narrow your choice down to the best models available. This doesn’t mean the most expensive generators. In this class, prices can go beyond the budget of many people. For most home generator applications, you don’t need to pay exorbitant prices for a high-end portable generator. We simply don’t use the generator enough to warrant paying this much. This is also true for many contractors and farmers. When it comes down to it, the average household generator buyer is going to use the generator once a year, perhaps two or three times. When there’s a power outage, having a generator to provide for your basic needs and few extra luxuries like an air conditioner is fantastic. Having a generator that’s portable means that you can also use it for camping trips and tailgating. High-end generators, with prices that are frighteningly close to $3000 (sometimes exceeding three grand) are designed for heavy-duty work on a constant basis. A generator like the Ford FG11050PBE provides an excellent alternative to the big Honda, CAT and DeWalt machines that are more industrial and, therefore, a lot more expensive. If you’re going to be using the Ford for your power backup needs at home and for vacations, you’re going to get years, even decades, of reliable use from the generator. One of the advantages to both these generators is the fact that they are hybrid (dual fuel) machines. Some of you may know about this technology. For those who would like to know more about dual fuel, which is the ability to run on either propane or gas, we’ll go into more detail about this after reviewing the Ford FG11050PBE and Westinghouse WGen7500DF. Perfect for emergencies, jobsites or to power your entire house. Power up to 5 major appliances at one time. Ford and Pulsar have teamed up to manufacture a range of generators that adhere to the basic philosophies of both brands. This is to provide quality products to the public at a price that’s perfectly reasonable for the average guy. To this end, the Ford FG11050PBE is exactly that – an affordable powerful generator at a very reasonable price. It looks really cool too, with hints of chrome detailing. Though good looks are not what I’m looking for in a generator. Build quality, performance, and features are what’s important here. I think that the Ford FG11050PBE is a real winner in this department too. When it comes to power, the Ford FG11050PBE beats most (if not all) generators in this class. The 457cc, OHV, 15HP engine gives the growling Ford a distinct advantage over most others in the 10KW range. The result is quite a few extra watts at your disposal. When using gas, this generator pumps out 11050 peak (starting or surge) watts and 9000W of continuous running power. This means that you have about a kilowatt more usable power than most other generators in this class. Whether on a construction site or at home, this extra power can make a big difference when using the generator. Using propane doesn’t reduce your power output by much, 10500W peak and 8550W of continuous power. The fuel consumption is really impressive. The 6.6-gallon gas tank will give you 10 hours of runtime at 50% load. This works out to 6.48 kilowatt-hours per gallon. I consider anything above 5 kilowatt-hours per gallon to be good for a generator. As you can see, the Ford FG11050PBE beats this benchmark by quite a good margin. That’s going to save you quite a pile of cash over the lifetime of the generator. The run-time spec for propane is 8-hours (20 lb. tank) at 50% load – which is about what you would expect from propane. It’s always a shorter run time than gas. The engine has low oil shutoff, so you have no need to worry about leaving the generator unattended for hours. Check the oil before starting the Ford and then leave it to do its job. If for some reason, the oil runs low, you won’t blow the engine. The Ford FG11050PBE is EPA and CSA certified. So it’s suitable for use in the US (except California) and in Canada. This is not a silent generator. Not that any generator (especially this size) is ever silent, but the Ford FG11050PBE has no sound insulation like some others. The muffler is pretty good though and the Ford produces 74dBA at 50% load with a maximum rated noise level of 78dBA. For a 10KW open frame generator, this is pretty standard. Taking into account that the Ford FG11050PBE has a larger engine than most and produces a higher wattage, these noise levels are more than reasonable. The Ford FG11050PBE is a super easy generator to use. It has electric starting. It doesn’t have an additional recoil starter which is something that I’d have preferred to see. If you leave the generator standing too long, there’s a chance that your battery might run flat and a recoil starter is great in these situations. Of course, it’s never a good idea to leave a generator standing for that long and it will be a good idea to start and run the generator for about 10-minutes every 1-2 months. This helps distribute the oil, preventing rust inside the engine and it will keep the battery charged. Even if the generator has a recoil starter, it’s recommended to do this. With six power outlets, the Ford FG11050PBE gives you complete versatility when it comes to connecting it up to your home, RV, or running extension cords directly from the generator. It has two duplex 120V 20A outlets, giving a total of four household power outlets. Then there’s a 120V 30A twist-lock outlet and a 120V/240V 30A RV outlet. There’s a main circuit breaker, as well as breakers for the individual AC outlets. All the power outlets have rubber covers for added safety and protection. A digital hour meter helps you keep track of service intervals and it has a very easy to read fuel gauge. Apart from the absence of USB outlets, the Ford FG11050PBE has all the outlets and features that you’ll find on any reputable modern generator. As is to be expected from a powerful generator with a larger than average engine, the Ford FG11050PBE is no lightweight. Lifting the 211 LBS that this machine weighs is no mean feat. Fortunately, the solid rubber 10” wheels take much of the strain off moving this heavy machine. It also has strong collapsible handles with comfortable grips to assist in this. For a long time, Ford has used the slogan “built Ford tough” to describe their motor vehicles. The same can be said for the Ford FG11050PBE. The collaboration between Ford and Pulsar has proven to be a winning recipe for producing quality generators at a great price. Their 2-year warranty should also give you a good deal of confidence when buying the Ford FG11050PBE. Visit Ford Power Equipment to learn more about their line of generators. Excellent value, comes with a 3-year warranty. Depending on where you buy it, the Westinghouse WGen7500DF should be a bit cheaper than the Ford FG11050PBE. Though I wouldn’t make this price difference my first consideration. The Westinghouse isn’t as powerful as the Ford (few portable generators are). If we’re going to look at dollars per watt, the Ford FG11050PBE is likely to beat just about any generator that’s worth buying. Though if you don’t mind having less wattage and would prefer to pay less for a generator that is just as good, the Westinghouse WGen7500DF is going to steal your heart. In some respects, the Westinghouse beats the Ford, depending on what you’re looking for in a portable generator. Full featured control panel makes it easy to use and operate. The 420cc, 13 HP, OHV Westinghouse engine with a cast iron sleeve is a tough and reliable unit. Though this smaller engine does mean a lower power output than the Ford FG11050PBE. 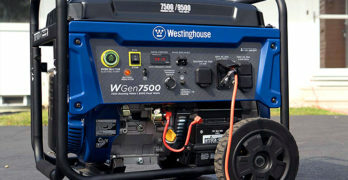 Running on gas, the Westinghouse WGen7500DF produces 9500 peak watts and 7500W running power. Using propane will lower this figure to 8550 peak watts and 6750 running watts. For some, CARB certification will come as good news – the Westinghouse WGen7500DF can be sold in California. It’s also CSA compliant, so Canada is also included in the regions where this generator can be sold. The Westinghouse WGen7500DF also has fantastic fuel consumption, only a snitch higher than the Ford FG11050PBE. It has the same size gas tank, 6.6-gallons and this will give you 11-hour runtime at 50% load. So you’re getting a longer time from a tank of gas but this is at a lower wattage. If we’re going to compare the two generators, we need to look at the kilowatt-hours per gallon. The Westinghouse WGen7500DF will give you 6.25 kilowatt-hours per gallon. When compared to 6.48 kilowatt-hours per gallon for the Ford, they are both well above average in the fuel economy department. When talking about generators, you can look at kilowatt-hours per gallon in the same way as you would miles per gallon with a car. The Westinghouse WGen7500DF is also fitted with an electric starter and has the advantage of a remote control. This means that you can start or stop the Westinghouse from a distance of up to 109-yards. There’s also the advantage of a recoil starter for emergency starting when the battery fails. It has an automatic choke and, like the Ford, this generator has low oil shutoff. Well Made : Hardened-steel frame features roll bars on the top of the unit. When it comes to power outlets, the Westinghouse has two USB outlets, something that the Ford FG11050PBE doesn’t. However, where the ford has two 30A outlets, the Westinghouse only has one 120/240V 30A L14-30R outlet. There’s an optional Westinghouse transfer switch kit if you want to connect the generator directly your house power. The 20A outlets are identical to the Ford FG11050PBE – 2 X duplex 120V 20A outlets. The Westinghouse WGen7500DF also has covers for the electric outlets and overload circuit breaker protection. This generator has a fuel gauge but lacks the digital hour meter that you’ll find on the Ford. Weighing 194 LBS, the Westinghouse WGen7500DF is slightly lighter than the Ford FG11050PBE, though it’s still a heavy machine. The 10” wheels and handles are almost identical to those on the Ford and transporting either of these generators will be about the same. Noise levels are also very similar, the specified noise level for Westinghouse is 74dBA. When it comes down to it, both the Ford FG11050PBE and the Westinghouse WGen7500DF are amazing dual fuel generators, both offering exceptional value for money. The Ford is noticeably more powerful and you’ll be paying a little extra for these watts. One feature that may attract many to the Westinghouse is the remote control which can be very convenient when using the generator in cold or stormy weather. The Westinghouse WGen7500DF comes with a very impressive 3-year or 1000-hours warranty for residential use and 6-months or 1000-hours for commercial use. Because both the Ford FG11050PBE and the Westinghouse WGen7500DF are both hybrid generators, I think it would be a good idea to discuss this for those who are not yet familiar with the concept. A hybrid generator, also known as a dual fuel generator, is designed to run on both gasoline and propane. The original reasoning for using this technology has been for environmental reasons. Around the world, people are becoming increasingly conscious about our impact on the environment and internal combustion engines play a massive role in elevating our levels of greenhouse gasses. Carbon monoxide (CO) and carbon (CO₂) are two of the main emission gasses associated with gas-burning engines and are not environmentally friendly. Propane burns a lot cleaner than gas and is, therefore, a popular choice for those who want to go green. In practice, there are some other advantages to using propane. Having dual fuel capabilities adds to this in that you have the versatility of using either propane or gasoline. This allows you to use whichever fuel is more commonly available. Propane can be cheaper in some areas, but this won’t always be the case. I don’t consider financial savings to be a decisive factor when comparing gas to propane, except perhaps that propane reduces your maintenance costs. Because propane burns cleaner, there’s less carbon buildup in your carburetor, spark plug, and exhaust system. To my mind, the biggest advantage of using propane (other than one’s environmental conscience) is the storage and safety aspects. Propane, described by its more official name, Liquid Petroleum Gas (LPG), offers a better understanding of why this fuel is beneficial for better storage. This is a gas that has been compressed into a liquid state. Basically, it’s very compact when stored in a propane cylinder. A 20 LBS propane tank is going to take up less space than a 5-gallon gas can. Typically, you’re going to get 20-30% longer running time from a 20 LBS propane tank than you would from a 5-gallon gas can. It’s not that you’re burning less fuel, it’s just that propane has been compressed – you have more fuel in a smaller volume. In fact, running a generator on propane is less efficient. An engine using propane will generally deliver about 10% less power compared to using gas. This means that the power output of your generator will be approximately 10% lower. When one looks at the performance specs for the Ford FG11050PBE, the difference between the running and peak watts for propane and gas really isn’t that big. When using gas it has a rated constant wattage of 9000W and 8550W using propane, the difference is only 5% and won’t really affect how you use the generator. The fact that a propane tank is totally sealed makes it much safer to store and transport. A gas can has to be ventilated. This is to allow the fumes to escape as the gas inside the can expands and contracts. The result is that all too familiar noxious smell that’s unavoidable with a gas can. These fumes are both toxic and flammable, so there’s a degree of safety risk surrounding the use of a gas can. Gas cans can also spill gas, either when transporting it or when transferring the gas from the can to generator’s tank. None of these problems exist when using propane. The LPG is only released when the pipe is connected to the generator. Provided that your pipe, regulator, and gas cylinder are in good working condition and you’ve connected it properly, there is absolutely no risk of leaking or fumes when using propane.